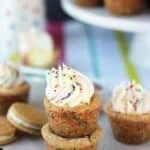 Funfetti Cream Pie Cookie Cups have a Golden Oreo crust and a funfetti cookie cups, filled with a dreamy vanilla mousse and topped with cake batter whipped cream. Warning: spoiler alert. Did you guys watch The Bachelor Finale? I don’t talk pop culture very much around here, but I was totally hooked on this season. I am so glad he picked Whitney, she is super sweet and seems to have a good head on her shoulders. However, I do not love that they picked TWO bachelorettes! I am totally on team Kaitlin though, she seems so much more genuine than Britt. Looks like I am going to have to watch the next season too. This must be how they hook you in. Do you guys know that Saturday is Pi Day as in March 14th, or 3-14? 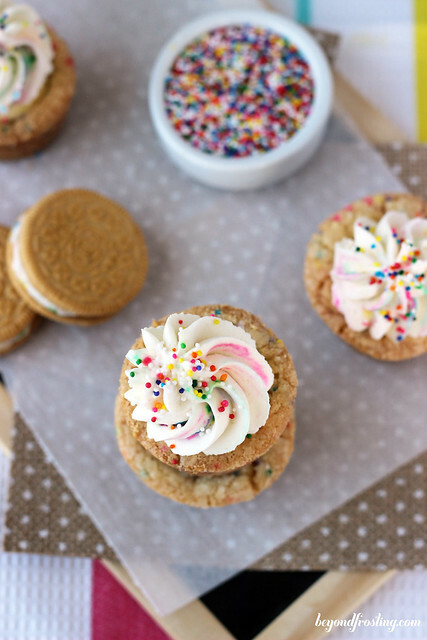 To prepare for Pi Day I made these Funfetti Cream Pie Cookie Cups. I am quite the fan of the cream pie cookies. 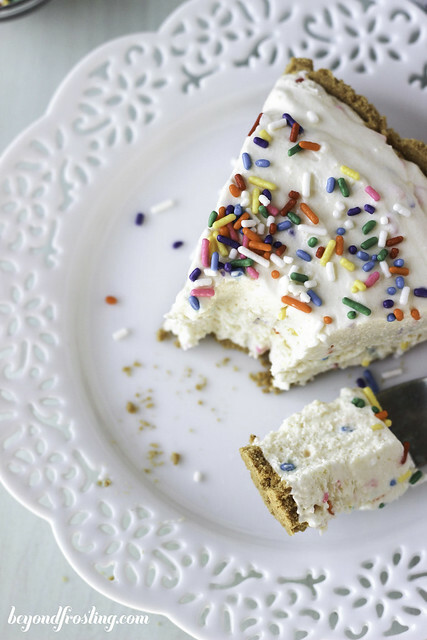 First you have the cookie crust and then you have the cream filling and then it’s topped with some cake batter whipped cream. Seriously, guys, it doesn’t get any better than this. I hope you are not tired of my cream pie cookies, because I will have more flavors coming your way this summer. In the meantime, be sure to check out my other versions: Red Velvet, Peppermint, Pumpkin and Coconut. 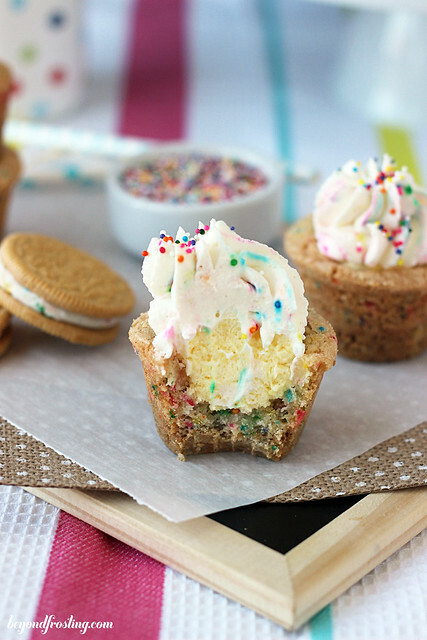 This recipe starts with a Funfetti cookie. It’s really easy, you just need to mix some dry vanilla cake mix into the dough, and reduce the amount of flour in the recipe. 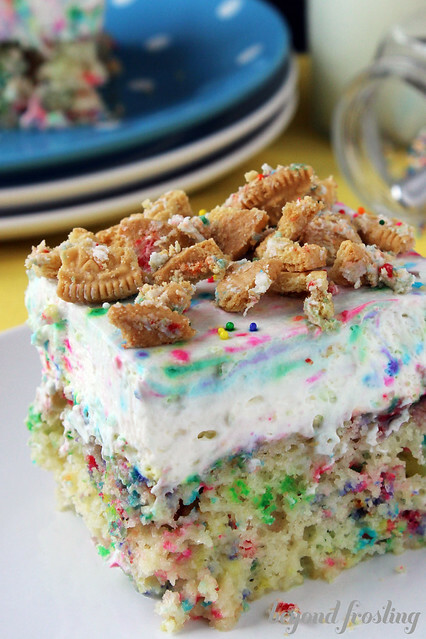 The thing you can’t really see in these photos is that there is a Golden Oreo cookie crust. 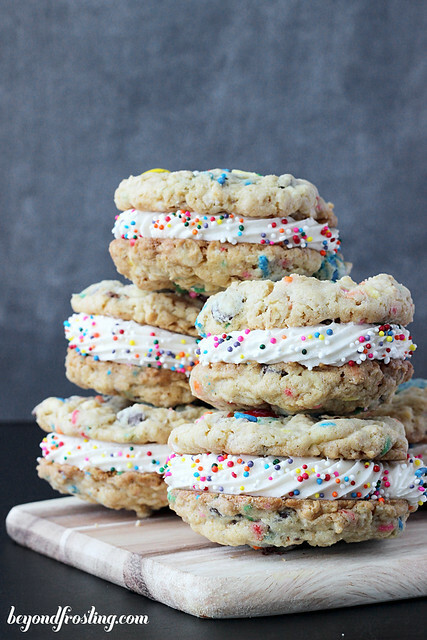 Obviously, you have to have a crust on your cream pie cookies. 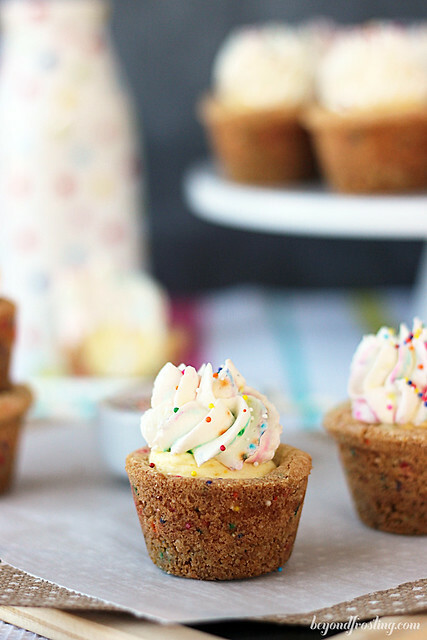 What makes these cookie cups so awesome is the deep dish mini muffin pan that I use. It is the Calphalon Mini Muffin Pan and I use it ALL the time! It is larger than your standard mini muffin pan, but that’s what I like about it. 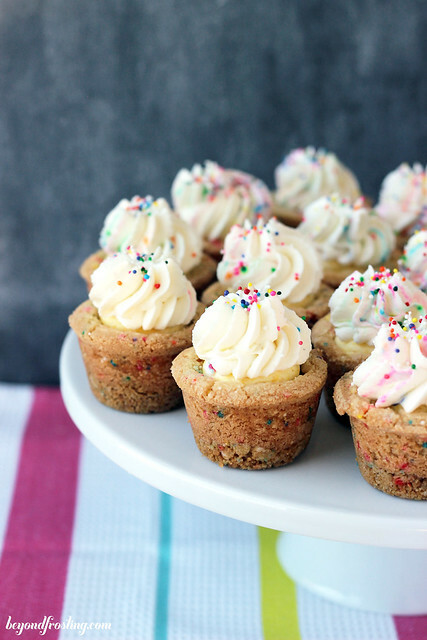 For the filling of these cupcakes, it is a simple cheesecake mousse made with cheesecake pudding and whipped cream. If you are unable to find cheesecake pudding, you can also use vanilla. I just can’t stop eating the filling, I think it is because it’s so light and airy. The whipped cream I use for the mousse is the same whipped cream that I use for the topping. Instead of using powdered sugar, I use dry cake mix. 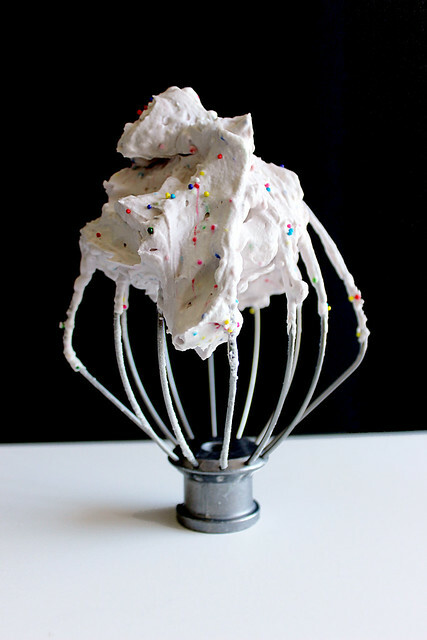 This create CAKE BATTER WHIPPED CREAM! Trust me when I say that this trumps all homemade whipped creams. I used it on this Funfetti Poke Cake. You will divide half the whipped cream to mix into the mousse and half the whipped cream to put on top of the cookie cups. 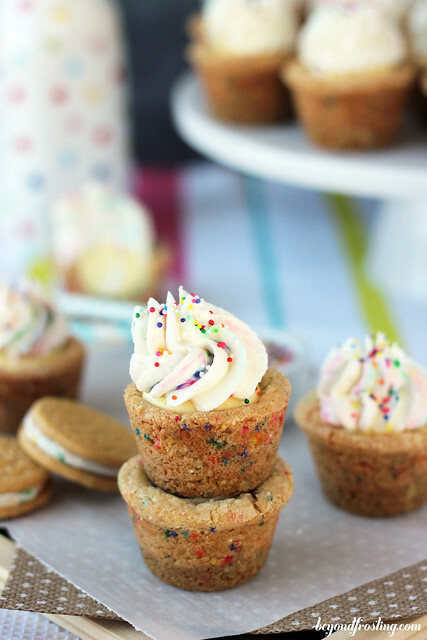 There are a few steps involved in making these cookie cups, but it is totally worth it. Sometimes I make the cookies in advance and them freeze them until I am ready to make them into my final dessert. 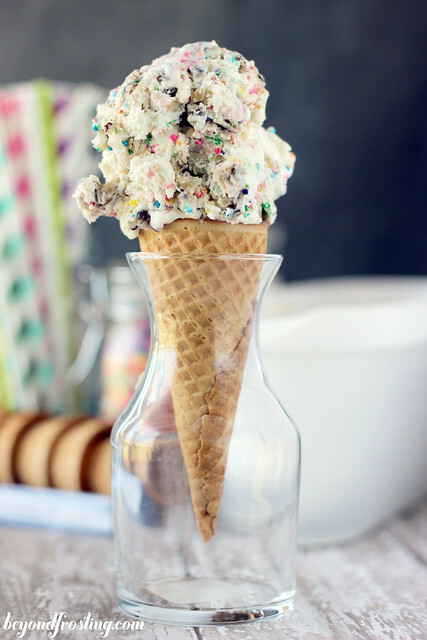 Plus, sprinkles make everything better. It’s a fact. In a separate bowl, combine flour, cake mix, baking soda and salt. Stir and set aside. Soften butter in the microwave for 15 seconds. Combine softened butter and sugars in a mixing bowl. Beat on medium speed until light and fluffy; 2-3 minutes. Add egg, vanilla, and butter extract and beat until well combined. Reduce mixer to low speed and slowly add dry ingredients. Once combined, increase speed to medium high and beat for 1-2 minutes until soft dough forms. Add sprinkles and beat into dough. Prepare the filling while the cookies are baking. Add dry cake mix and beat on medium high until stiff peaks form. Refrigerate whipped cream. Combine instant pudding mix with milk. Whisk until powder dissolves. Refrigerate until pudding is firm. For the remaining whipped cream, gently fold in sprinkles. Do not mix too much as it will change the color of the whipped cream. Top mousse with a dollop of the leftover whipped cream and sprinkles. I used an extra deep mini muffins pan. If you have a traditional mini muffin tin, reduce the amount of cookie dough. 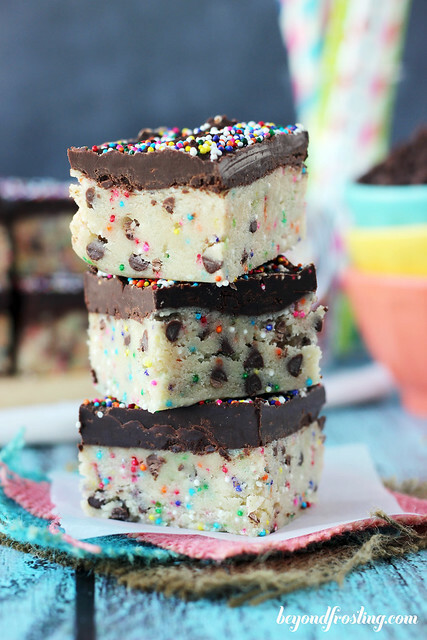 Hi these look yummy! Do u have to do an Oreo crust? Or what’s the purpose? Hi Megan, the purpose of the crust is just that these are mini pies. You certainly don’t have to do the Oreo crust.